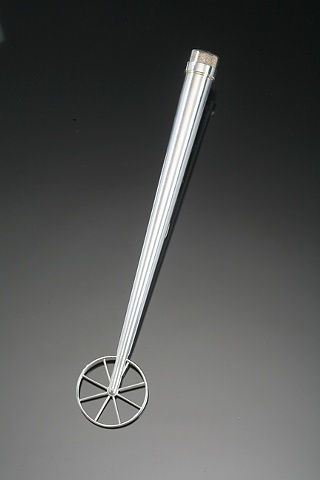 This Torah pointer has a working wheel for the pointer and encased sand on the opposite end. The wheel pointer of this yad can be interpreted as a metaphorical connection to the Jewish people's early forced nomadic life or any of the other exiles that have been endured throughout Jewish history. It can also symbolize a surveyor's wheel in reference to the use of the Torah in the current territory disputes in Israel.